Hawa greeted her husband who just returned home from helping at a burial ceremony of a close friend who died suddenly of a terrible sickness. After being home for only a week, Hawa’s husband himself became sick with “hot skin” (fever), headache, “body pain” (myalgia), sore throat, cough, and fatigue. Hawa cared for him with traditional herbal remedies, but he continued to worsen. He suffered abdominal pain, severe nausea, vomiting, and “toilet fast-fast” (diarrhea). His eyes became gritty, tearful, and red. By day six of his illness, he was unable to get up, curled in a fetal position on the mat that was dirty with his vomit and excrements. It was impossible to keep him clean for long because of the continual vomiting and diarrhea. No one came to help her. Hopelessly, she watched her husband decline rapidly, bleeding from his gums and lips, becoming unconscious. He died soon after. Hawa sent her son for help. He returned shortly saying no one was willing to come, but that the village leaders were getting help. Hawa did not understand why her friends and family refused to help. Hours went by and no one came. She went to fetch water, but everyone avoided her and told her to keep away. As she was returning home from the well, she saw a vehicle park along the side of the dirt road. She felt terrified as six creatures that looked like ghosts headed towards her home, led by two village elders. She dropped everything and ran into her home towards her children who were huddled around her dead husband. Hawa received information that was difficult to understand, but finally understood that a deadly disease called Ebola was going around the country, being passed from person to person, and that a dead body was highly contagious. She was asked lots of questions about her husband’s illness and about details of the burial ceremony that he had recently attended. She watched the men in the white suits put her dead husband’s body inside a large plastic bag. They told her where and how her husband would be buried. Hawa panicked as she saw everything being done against the normal traditions, and mourned afresh that her husband would not receive a proper burial ceremony. She was warned that if she or her children became sick or developed fever, she needed to come to the Foya Case Management Centre (CMC). One week later, Hawa and her children appeared there with symptoms. When the Ebola outbreak began to spread in Liberia, Samaritan’s Purse decided it must join the battle against this horrible disease and work hand-in-hand with Médecins Sans Frontières (MSF, Doctors Without Borders), in partnership with Liberia’s Ministry of Health (MOH). Samaritan’s Purse is a Christian international relief and development organization operating in more than 100 countries. It has been in Liberia since 2004, providing various community development programs. I was deployed as a DART member in the beginning of July 2014. Never in my dreams did I consider that I would be in full Personal Protective Equipment in the front lines battling Ebola in the hot, tropical region of West Africa. Dr. Marthyman in his protective gear. Photo credit Samaritan’s Purse Canada. This young nurse came to the Foya Case Management Centre when she and her nurse assistant friend became sick. They did not initially realize that the patients they were caring for were infected with the Ebola virus but with the increased Ebola awareness in their district, they decided to come to our Case Management Centre when they developed symptoms. 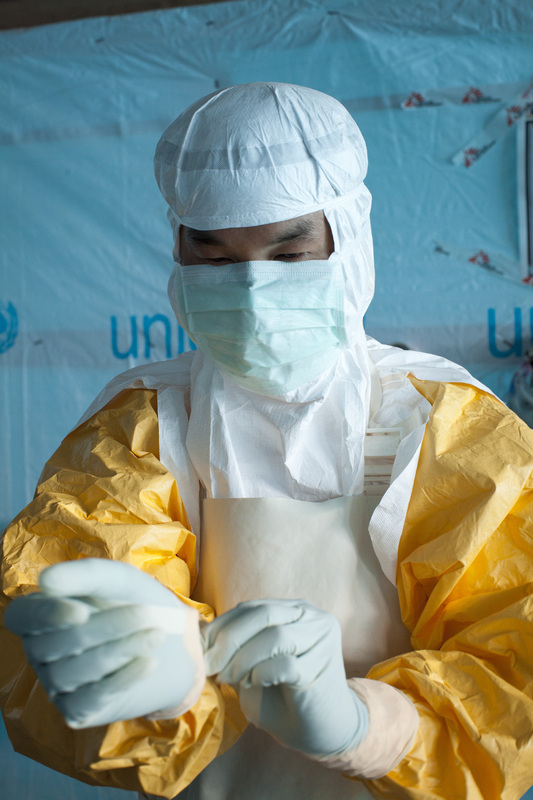 They come from an area where the people have been in denial that the Ebola virus exists. Unfortunately, this nurse witnessed her friend die from the Ebola hemorrhagic fever, while she herself came to a near death experience. My CMC days were filled with emotional highs and lows. Initially, I asked myself if what we do clinically makes any difference. With historical numbers as high as a 90% fatality rate for those who contract Ebola, I was encouraged that our death rate at the Samaritan’s Purse CMC was substantially lower at around 45-50% during my deployment. 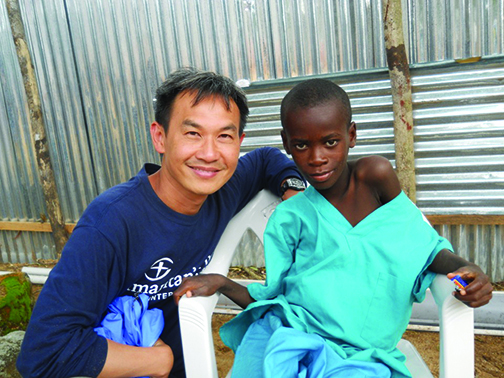 Our medical care made a big difference to save lives and bring hope to the people. The battle against Ebola and the care of patients with Ebola presently involves community education and awareness, contact tracing, early detection and diagnosis, isolation to prevent transmission, supportive measures to maintain cardiovascular stability, prophylaxis and treatment of concurrent diseases such as malaria, appropriate empiric antibiotic coverage to prevent sepsis, symptom relief, nursing care, appropriate nutrition and oral hydration, psychological counseling and emotional support, spiritual encouragement and sustenance, and holding on to hope. One person who was near death and who now walks again is Hawa. While in the CMC, she witnessed two of her children die. Her oldest son amazingly remained asymptomatic throughout with repeatedly negative Ebola polymerase chain reaction (PCR) tests. Except for altering her name, this true story exemplifies the impact of the deadly Ebola virus upon the people of West Africa. Do personal protective equipment have a coating which changes color when in contact with bodily fluids? This benefits practice sessions and actual conditions. Knowing the location of fluids alerts one prior to doffing. Too much contamination increases the susceptibility of exposure.